At any given moment, how many transistors are turned on and how many are turned off? Also, explain what would happen to the function of the circuit if resistor R1 failed open. Two transistors are on at any given time, and the other two are off. If R1 fails open, the motor will not be able to go in the "forward" (Fwd) direction. Challenge question: what type of DC motor is this drive circuit designed for? 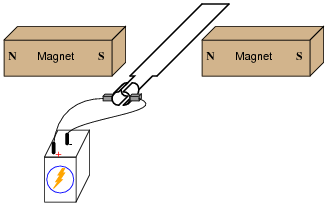 Shunt-wound, series-wound, compound, or permanent magnet? Explain your answer. The "H-drive" circuit is a very common method of reversing polarity to a DC motor (or other polarity-sensitive load), using only a single-pole switch. Very, very large electric motor "drives" have been based on this same design. Transistor Q1 fails open (collector-to-emitter): Motor fails to turn in "reverse" direction, can still turn in "forward" direction. Transistor Q2 fails open (collector-to-emitter): Motor fails to turn in "forward" direction, can still turn in "reverse" direction. 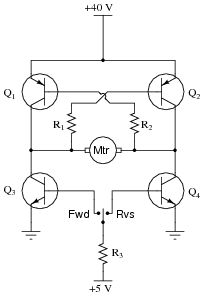 Transistor Q3 fails open (collector-to-emitter): Motor fails to turn in "forward" direction, can still turn in "reverse" direction. Transistor Q4 fails open (collector-to-emitter): Motor fails to turn in "reverse" direction, can still turn in "forward" direction. Resistor R1 fails open: Motor fails to turn in "forward" direction, can still turn in "reverse" direction. Resistor R2 fails open: Motor fails to turn in "reverse" direction, can still turn in "forward" direction. Resistor R3 fails open: Motor cannot turn in either direction. Transistor Q3 fails shorted (collector-to-emitter): Motor turns in "forward" direction even when the switch is in the center (off) position. Transistor Q4 fails shorted (collector-to-emitter): Motor turns in "reverse" direction even when the switch is in the center (off) position. Explain what a servo motor system is, in your own words. 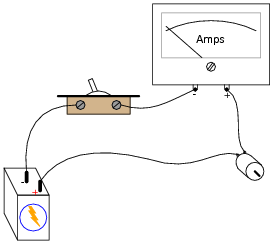 A servo motor is one whose position is controlled by a negative feedback system. I know, this definition is very minimal, but then I want you to express the answer in your own words! Servos come in many different types and sizes, but they all share similar characteristics. Your students should have no problem at all finding information on them. Radio-controlled toy cars, airplanes, and boats use small servo motors for positioning of the steering mechanisms, engine throttle position, and such. These servos have the motor, position sensor, and control electronics housed in the same plastic package, making them very compact. Research the type(s) of control signals used to command these servo units. In other words, find out what sort of electronic signal they require to "command" them to go to certain positions. Then, suggest a circuit that could generate these signals. I will not give an answer here, not just because I want you to do all the research and thinking for yourself, but also because RC servo technology may have changed changed since I wrote this question! The availability of inexpensive RC servos makes them ideal for use in lab experiments and student projects. It is well worth your students' time (and yours!) to find out how these amazing little devices are controlled! Determine all component voltage drops in this circuit when the motor is operating in the reverse direction. Be sure to explain how you performed all the analyses! Assume 0.7 volts as the standard forward voltage drop for a forward-biased PN junction, and 0.3 volts as the standard collector-to-emitter voltage drop for a saturated BJT. I'll give you a hint: use Kirchhoff's Voltage Law. Challenge question: what type of DC motor must this be, to be reversed in rotational direction by a reversal of polarity? The primary purpose of this question is to give students more practice using Kirchhoff's Voltage Law. Be sure to work through the analysis of all component voltage drops.